The Model CXC features standard forward, neutral, and reversing options, controlled by a long-lasting toggle switch for easy adjustment while throwing. The modular-style foot pedal, motor, and control box make trouble-shooting and repair a breeze. The poly v belt drive system has been a favorite among teachers and potters for more than 40 years. 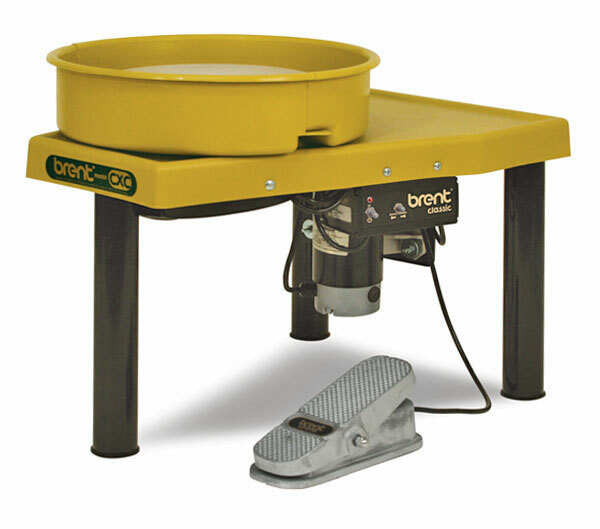 The Model CXC is a heavy-duty wheel for educational programs and potters who depend on strong, consistent performance. It features all-steel construction, a tough 1 HP motor, a 14" (36 cm) wheel head, a heavy 1/4" (6.4 mm) steel table, and a poly v belt drive system. The six-groove self-tensioning seamless belt provides the best combination of power, efficiency, and smooth control, allowing this wheel to continuously handle up to 300 lb (136 kg) of clay. A splash pan, 14" (36 cm) Plasti-Bat, and How to Throw on a Potter's Wheel DVD are included. Shipping weight is 126 lb (57 kg). Includes a 10-year warranty. CE-certified.